Based on the commercials and previews I didn't have high expectations for this movie, but I just finished watching it and have to say I quite enjoyed it. The animation was beautiful, the voice acting was top notch, and the story dealt with deeper themes than I'm used to seeing in Disney films while at the same time being very funny. 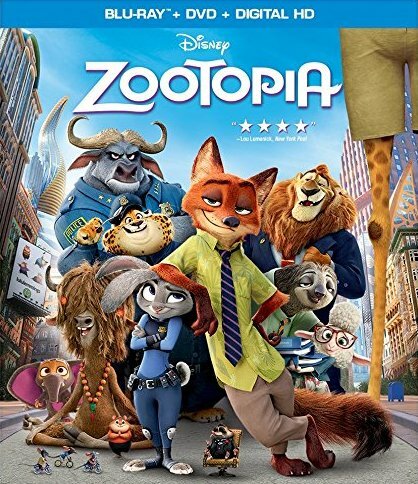 At its core Zootopia is a buddy cop movie, with a bunny named Judy Hopps being the cop and a sly grifter fox named Nick Wilde being her reluctant buddy. The two team up to solve a rash of animal disappearances and learn a little something about themselves in the process. One thing I really like about this world was that it accommodates animals of all sizes, from the very large to the very small. It was a great dynamic that made the world seem not so one-tone. Another aspect of the movie that I really liked was that there was zero romantic subplot between the two leads even though one was female and the other male. Rather, they focused on friendship and overcoming their preconceived prejudices. The characters and biases seemed grounded in the real world which I think helped give this movie more of an emotional punch but there was enough comedy and positive energy to not make it a dark movie. So very well balanced! The voice actors include Ginnifer Goodwin, Jason Bateman, Idris Elba, J.K. Simmons, Jenny Slate, Tommy Chong, Alan Tudyk, and many others, and they all did a great job. I was especially fond of Chong's character, he made me laugh almost all the way through his appearance. Extras include a feature-length documentary called The Origin of an Animal Tale which delves into the making of this movie from the very beginning and is really interesting. There's also a featurette about the extensive research that Disney did before making the movie called Research: A True-Life Adventure, several deleted scenes, deleted characters, a featurette called Zoology: The Roundtables which gives a deeper look into the characters, animation, environments, and more. This not only turned out to be a great movie but this is a great blu-ray release with many enjoyable extras.